High R-Value: 6.2 per in. 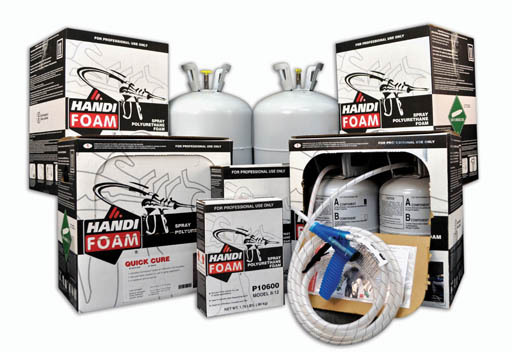 HANDI-FOAM® Quick Cure is a Low Pressure Polyurethane Spray Foam kit commonly used for sealing and insulating exterior walls, rim/band joists, basement walls, and foundation walls. Other uses include: insulating metal buildings, marine applications, and stage props. Quick Cure is a medium density (1.75 lb) foam that cures to fairly rigid in several minutes. It can be sanded and painted if desired. This product qualifies for a 10%* credit on your 2015 taxes. All Handi Foam kits include: Both tanks (A and B), Gun/Hose Assembly and Foam Spray Nozzles.